I love SeeSaw's Vintage Shop on Etsy. I got a wonderful dress from them a while ago (from a sale in an underground bomb shelter! So wonderfully different) and I make a point to check out their shop regularly. 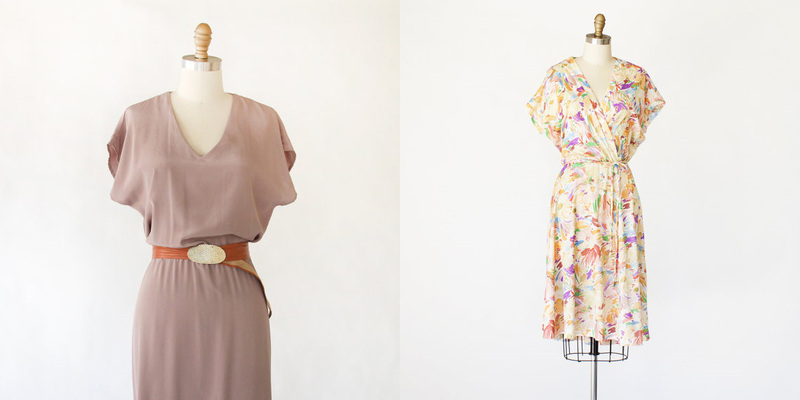 They have so many pretty dresses right now and I am so sad that these two won't fit me. The Summer Shift Dress (left) looks so wonderfully light and breezy for summer and the Floral Brush Stroke Dress (right) has such pretty colors and a flattering silhouette. Love the floral dress. So lovely. Thanks fo sharing. Ooo, I really want her houndstooth skirt. What a cool site! Wow, I love that summer shift dress. Fabulous color! What a great shop, looks really well run. thanks for the shout-out kayla! hoping to add some more goodies soon.